The Vatican authorities are in conservation crisis today because they stripped the Sistine Chapel frescoes bare in the 1980s and 1990s. 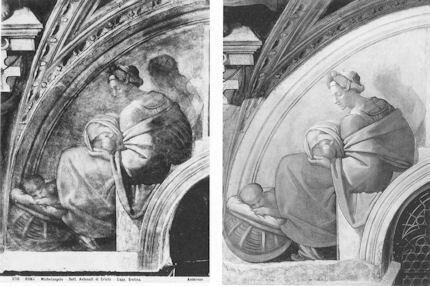 They did so against material and historical evidence that Michelangelo had finished off his frescoes with additional glue or size-based a secco painting (see right and our posts of 1 April 2011 and 12 November 2012). That original, autograph material was removed in full knowledge that the stripped-down bare fresco surfaces would thereafter be attacked by atmospheric pollution unless given some other protective covering (see Appendix below). An attempt to coat the frescoes with synthetic resin (Paraloid B72) was abandoned leaving some surfaces clogged and the rest unprotected. The authorities then promised to install hi-tech paraphernalia that would somehow prevent the polluting atmosphere from making contact with the Chapel’s painted walls and ceiling (see caption at Fig. 4). As was shown in our previous post, that cockamamie promise was not delivered. Today, in a chapel increasingly over-crowded with paying visitors (see Fig. 1), these stripped-down frescoes stand in greater peril than ever. Ironically, the “cleaning” of the ceiling, which arguably constitutes the greatest single restoration calamity of the 20th century, occurred at a time when picture restorers had skilfully rebranded themselves as safe, scientifically validated “conservators” of all that is valuable – even though Kenneth Clark had recently admitted to having founded the National Gallery’s science department in the late 1930s in order to dupe the public and wrong-foot restoration critics. A grandly titled “Laboratory for Scientific Research” had been created at the Vatican in 1922 on the “latest ideas” but during the 1980s Italian restorers admitted that running technical “tests” before restorations was professional “window-dressing” because it was always known in advance which materials were to be used. In the last twenty years it has become clearer that the claimed scientific underpinnings of picture restoration methods were spurious and that an appreciation of the workings of art and its internal relationships is not to be gained through some analysis of material components in a laboratory, however highfalutin and expensive the “investigative” or “diagnostic” apparatus may be. Beyond its conceptually simplistic and aesthetically impoverished terms of reference, the very reporting of “scientific” conservation methods has lacked both critical rigour and methodological consistency. In practice conservation science has provided a flag of convenience under which fundamental artistic questions can be evaded while ever-more ambitiously grandiose, lavishly funded and spectacularly transforming projects are launched. The authorities at the Vatican seemed quite oblivious of the ease with which even the most modest restorations can escalate into dangerous and irreversible treatments. Note that because it had been decided that it could be done, it was “therefore” also decided that it should be done. In Part II we investigate the means, the methods and the artistic consequences of that novel application of a new cleaning agent to the very old, very precious decorated surfaces of the Sistine Chapel. In doing so we also show why the Vatican’s curators were right to be scared. “A major purpose of the conference was to underline a basic truth: the conservation of any work of art is doomed to failure unless equal emphasis is given to its past and its future vicissitudes…Scientists and historians worry that conservators can be too ready to intervene, too impatient of prior tests, and insufficiently heedful of future dangers.” ~ Kathleen Weil Garris Brandt, Professor of Fine Arts, at New York University’s Institute of Fine Arts, and spokeswoman for the Vatican on the restoration of Michelangelo’s Sistine Chapel frescoes, reporting the proceedings of the “London symposium on the conservation of wall-paintings” in the November 1987 Burlington Magazine. “There is therefore much concern about the future of the frescoes, given that no protective layer has been applied in this campaign (the controversial use of paraloid was abandoned at an early stage of the cleaning of the lunettes). The Vatican has decided to seal the windows and introduce an air-conditioning and filtration system. Doubts were expressed at the conference. Could the threat from faulty air-conditioning be worse than the threat from atmospheric pollution and mass tourism? 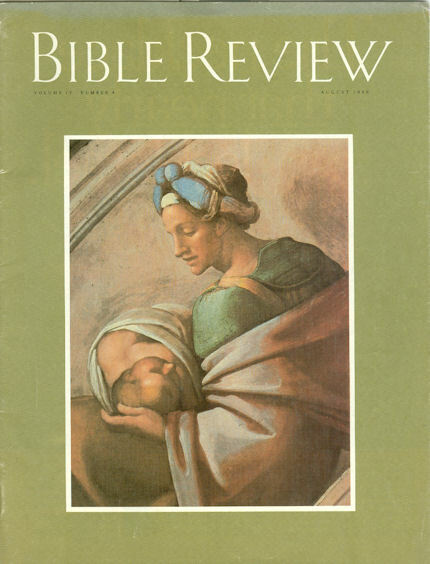 ” ~ Caroline Elam, editor of the Burlington Magazine, reviewing the 1990 symposium on the Sistine ceiling restoration held in Rome to give preliminary consideration to the cleaning of Michelangelo’s “Last Judgement”. 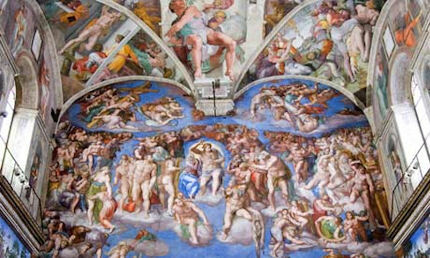 “A ‘drunken herd’ of ‘unruly’ tourists is damaging Michelangelo’s famous Sistine Chapel paintings, one of Italy’s leading arts figures claimed as the pope prepared to mark the 500th anniversary of the iconic frescoes’ creation. Some 5 million people visit the chapel every year – sometimes as many as 20,000 in a single day — and an increasing number of experts are now arguing that mass tourism is damaging the paintings. 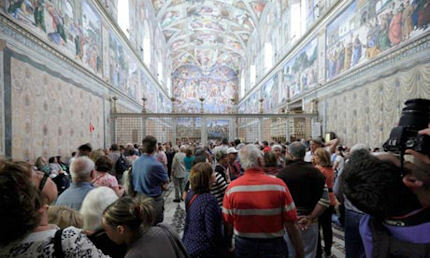 Despite a major, 14-year-long restoration project in the 1990s, they claim that the breath, sweat, dust and pollution brought in by visitors dramatically changes the Chapel’s humidity and temperature – factors to which frescoes are particularly sensitive…” ~ Claudio Lavanga, NBC News, 31 October 2012. Above, Fig. 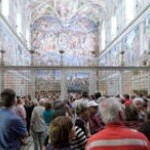 1: Visitors thronging the Sistine Chapel as shown in the 21 December 2012 Guardian (Photograph: Oote Boe Ph/Alamy). Above, Fig. 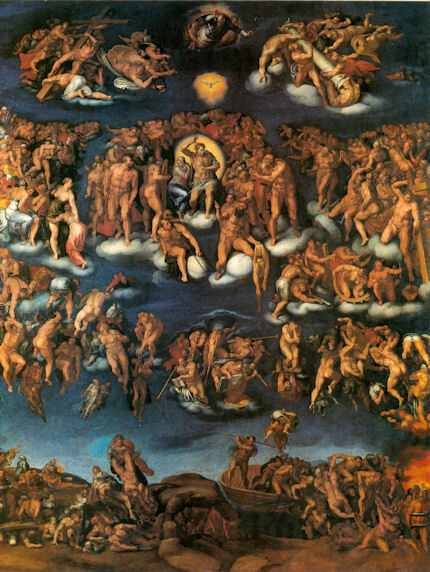 2: Some indication of the extent to which Michelangelo’s “Last Judgement” has departed from its original self may be gauged from this 1549 copy by Marcello Venusti which was made not only within Michelangelo’s lifetime but also met with his approval. Above, Fig. 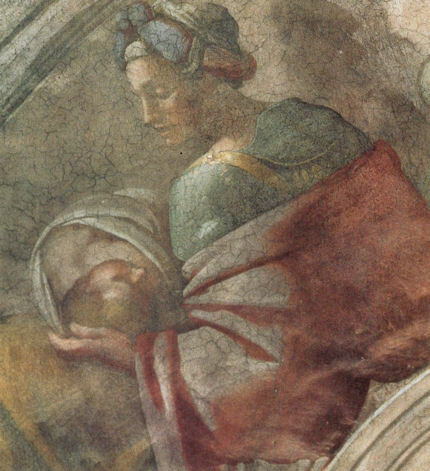 5: A detail – before cleaning – of one of the ancestors of Christ depicted by Michelangelo on the lunettes (the sections of wall that surround the tops of the Sistine Chapel’s arched windows). Above, Fig. 6: The detail of the ancestor of Christ shown above, after cleaning. Above, Fig 7: The complete figure shown above at Figs. 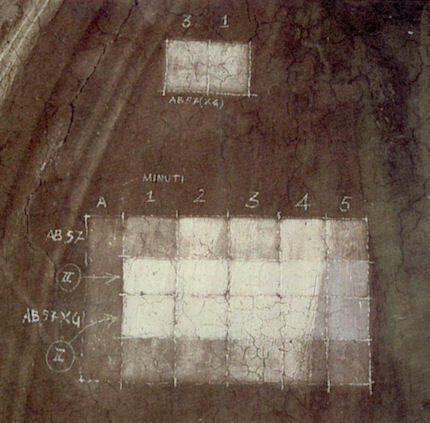 5 & 6, as published in a December 1989 article, “SALVIAMO ALMENO il Giudizio Universale”, in the art magazine Oggi e Domani by the sculptor Venanzo Crocetti. 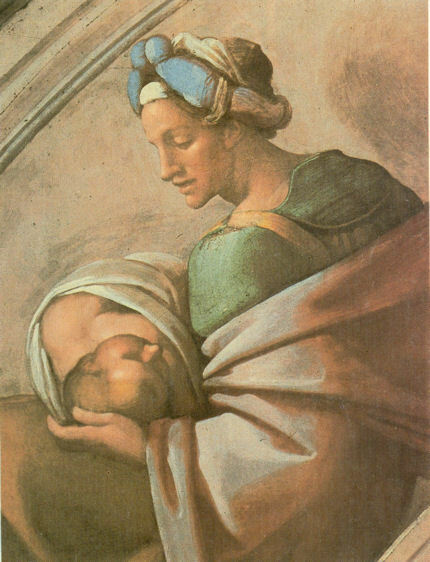 As a young man Crocetti had worked on a restoration of the Sistine Chapel ceiling in the 1930s and was one of the earliest critics of the last restoration. His photo-comparison shows the figure before cleaning (left) and after cleaning (right) and therefore pinpoints the indefensible inversions of value that occurred, where what was once darker than becomes lighter than, and vice versa. Above, Fig. 8: A test cleaning strip made on one the lunettes, to show the effects of the cleaning gel when left in place for varying lengths of time. Above, Fig. 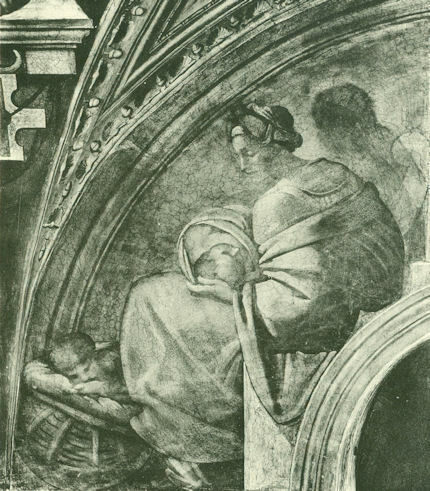 9: The figure shown above, as published in Charles de Tolnay’s 1945 “The Sistine Chapel Ceiling”. 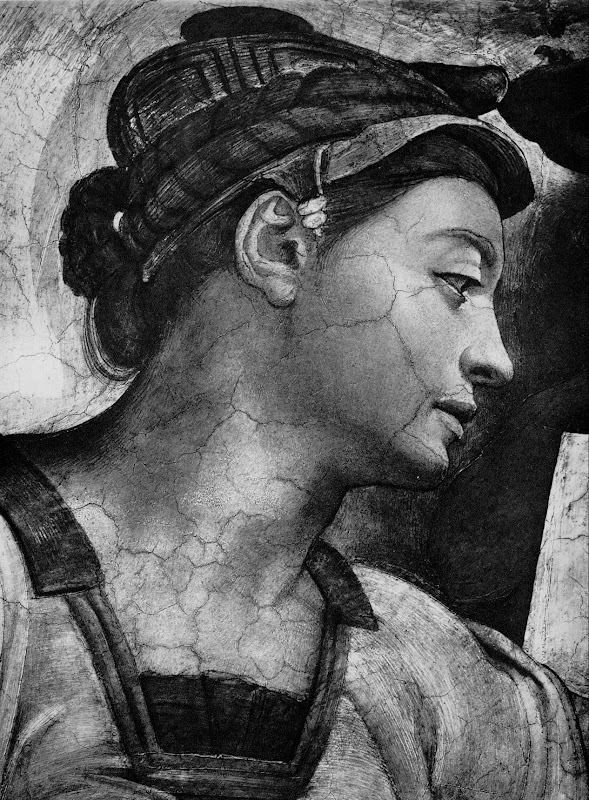 In the section on the volume’s illustrations, the brilliant Michelangelo scholar and Columbia University professor wrote: “Because of the war it was not possible to procure the same quality of ink for the reproductions as that used in the first volume, and therefore the chiaroscuro lost something of its softness.” Tolnay died in January 1981. Soon after, Fabrizio Mancinelli claimed that his cleaning had led to the “surprising conclusion that the kind of suggestive painting by shadows for which Michelangelo was admired until a few years ago was essentially the product of candle-smoke and still more of glue varnishes”. Mancinelli died some years ago and can therefore no longer defend himself, but his attributing of Michelangelo’s brilliant sculpturally informed chiaroscuro to the arbitrary centuries-long cumulative effects of smoke and glue, must stand as one of Scholarship’s loopier contentions. 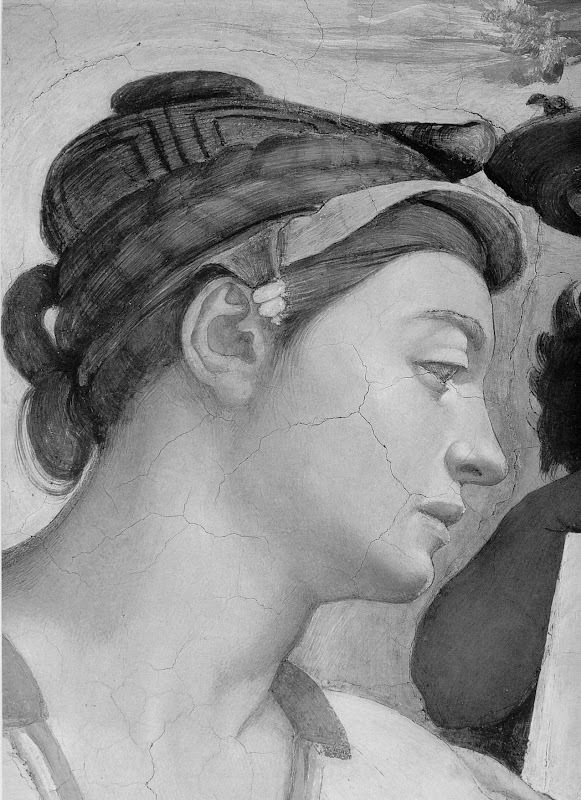 Above, Fig 10: The head of Michelangelo’s painting of the Erythraean Sibyl on the Sistine Chapel ceiling, as seen before restoration (left) and after restoration (right).